Hello everyone, today we are going out from the craziness of the big city looking for peace and relax.Finding excitement in Buenos Aires isn’t difficult, but finding peace and tranquility, on the other hand, can be quite a task. We have many options to go out for some few days when in Buenos Aires. I classify them in 3 groups: countryside, river and beaches! So, take your best shorts and swimsuit… we are going to the beach, yea! MAR DEL PLATA, located along the coast of Buenos Aires Province (roughly 4/5 hrs by car, or 50 minutes by plane), is a perfect place to spend a long weekend (and more!) if you just want to get away for some rest and relaxation. But, why we should go to Mar del Plata? Most travellers come to Mar del Plata for on reason and one reason only… beaches!. But we think there is soooo much to do. Mar del Plata is not only the most popular city along the Argentinean Coast, but it also is where we have more offers, attractions and things to do… let’s start! Parks, beaches, fields, sierras and lakes… what do you prefer? Take an stroll along the sea. Enjoy the beauty of the Mar del Plata’s 47km coast. I specially loved the “Corredor Saludable” (or Healthy Corridor): every Sunday morning a section of the coast is closed to the vehicles and people just take it!. There also are free sport classes and activities. • Long Nightlife -with sunrise included! Influenced by traditions and the sea, there is much to taste than just meat and dulce de leche… Fish, seafood, pastas, asado, alfajores, ice creams, sandwiches de miga, candies, pastries, churros. • Wide Beaches -and fresh water! Golden sand, white sea foam, rough waves, impressive cliffs, one of the oldest hill system with millenarian stones (Tandilia Hill System) and green esplanades, all along its 47 km of coast. Some beaches can be really busy in summer, especially in January. From children to retired people. There are not excuses for not having fun when in Mar del Plata. Theatres, museums, excursions, surf and tango lessons, trekking, fishing, biking, golf courses, paragliding over the coast, casino, live music, open air spectacles, markets… you better think what you want to do and then do it! On the other hand, don’t miss the opportunity to buy regional products (wool and leather products are highly recommended), traditional pastries and handicrafts. Facing the Atlantic Ocean, Mar del Plata is located 400km south of Buenos Aires city. 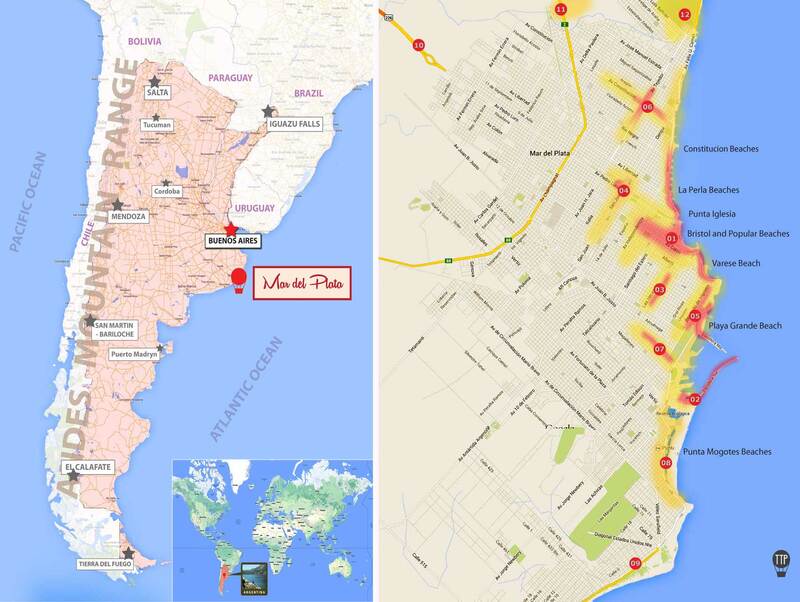 Ref: 1- Center / Downtown 2- Port 3- Guemes Street (mostly shopping) 4- Bus and train Terminal / San Juan Street 5- Playa Grande / Alem Street 6- Constitucion Avenue 7- Juan B. Justo Street (good to buy products of leather and wool) 8- Punta Mogotes Beaches 9- To the Southern Beaches / To Miramar 10- To Sierra and Laguna de Los Padres 11- Camet Airport / To Buenos Aires (Autovia 2) 12- Camet Park / To Santa Clara . How to go? / How to get there? By Car or Bus: 4/5hrs. The highway (Autovia 2) is safe and direct. Price bus tickets (return): around AR$500/€42By Train: over 6hrs. By Plane: 50 minutes. The airport (Camet Airport) is located 10km north to the center. The public bus nr 542 will take you to the center or take a taxi right there. How much time do I need? A long weekend is perfect to go around the city. On the other hand, staying for 7/15 days is also good (not that recommendable in winter), so you can take short or daily escapes to the nearby villages along the coast such as Miramar, Mar de Cobo, Pinamar, Carilo, Mar del Las Pampas, Tandil… depending on what you look for. Best Time to Go From the beginning October to the end of April, being January the busiest month. – As the city is quite sprawling, it’s a good idea to hire a car. – It’s a nice option to go to the Port at the afternoon to see the characteristic fishing yellow-boats arriving. The Port is a colourful area located to the south of the city. – If you go to the southern beaches, have a break at Mirador Waikiki (restaurant): the food is average, but the place and views are really “really” good. Whether we are looking for a cultural travel or simply to take a rest at the beach, Mar del Plata has everything for us. We hope this guide help get you started! That’s all so far… Enjoy Life. Love a lot! PHOTO TIPS… How to Take Photos from an Airplane. TRAVEL TIPS… Saving money when travelling. Tags: activities, attractions, destinations, facts, general information, holidays, how to go, maps, travel, TTP Free Travel Guide, what to do, what's on. Bookmark the permalink. Look lovely, delicious, and fun! Merci, too, for visiting my blog. Hi Adeline. Having a nice blog/websie is not hard but it requires time, patience and work.